We all want to keep our money ‘mine’y. The last thing you want while overseas is for any of your valuables (including your travel money and bank cards) to be taken from you. Not only is it a costly inconvenience, it can leave you feeling stressed and unsafe – potentially ruining your trip. We want to avoid this outcome for you at any cost. So let’s go through some of the different ways you can safely carry your currency abroad. Remember: The more discrete you are with your money, the safer it will be. 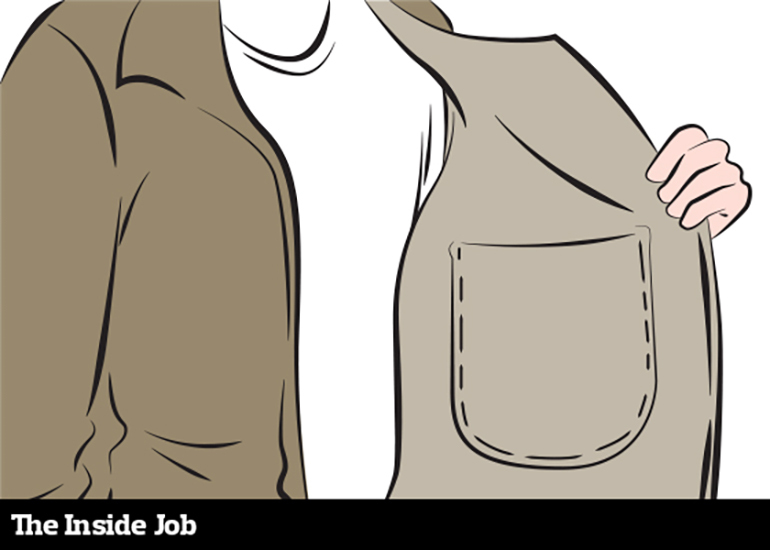 Believe it or not, an inside pocket on a coat can house more than a dirty hanky. 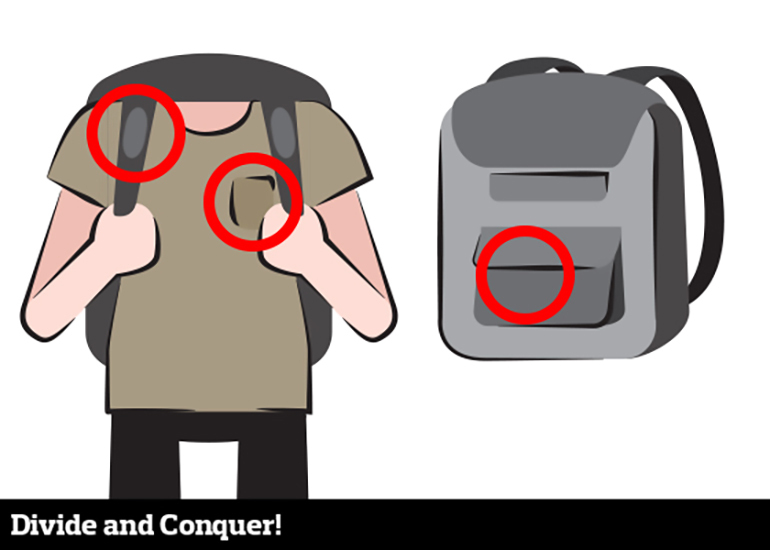 In fact, it’s a sneaky and secure place to store basic valuables – including cash and your pre-paid travel money cards. It’s quite hard for a thief to reach into your coat, making it a secure place to store backup currency. Although, we recommend keeping a small amount of cash in an easier, more obvious place. That way you won’t broadcast you have multiple places you’re keeping money. Remember: Take your cash out of your jacket before you wash it or leave it unattended at a restaurant. Break up your forces so that one defeat doesn’t mean the end of the war. Or, in relevant terms, store your money in multiple places so that if you’re robbed or lose your wallet, you won’t lose everything! While you’re out and about, divide your money between your wallets, a hidden pouch or split it with a travelling partner. This way, should anything happen while you’re out for the day, you should have money left elsewhere to rely on. Remember: That steel safe in your hotel room isn’t just for show. Hidden money bags offer a great way to hide your money. 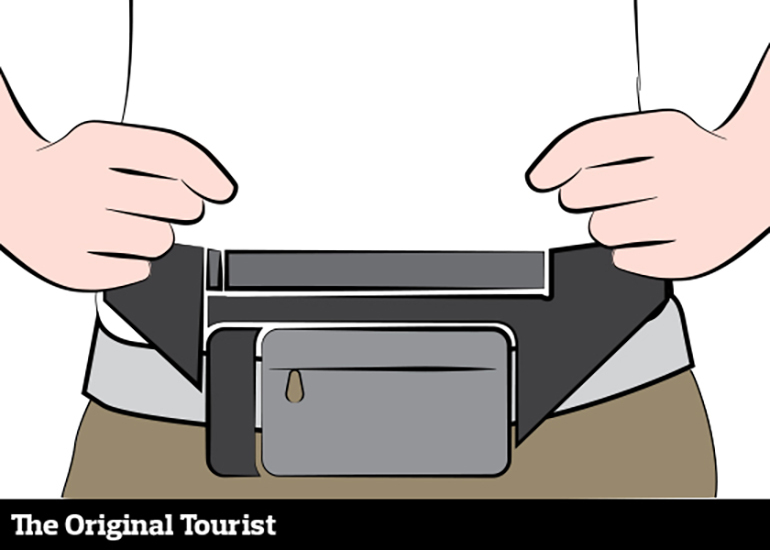 You can wear your money belt many different ways (e.g. across your chest, around your waist, or even around your neck). And yes they’re called ‘money’ bags, but they aren’t just for money. They’re also a great place to store your passport and any important travel documentation. Remember: Try and strap your money bag under a layer of clothing – keeping it out of sight and out of a robber’s mind. The dummy wallet. This is a genius play and something to consider if you’re visiting a destination where mugging is common. The concept it easy, should anyone poke around through your pockets or bags, they’ll find the take the fake and run off. Or if they approach you for your valuables, you can quickly throw them your dummy wallet and have them think that’s all you have. How to make one: Purchase a wallet that looks very real, pop in a few dollars, some expired cards (e.g. a gym membership card or an old public transport card) – things that aren’t of significant importance and ta-da, you have yourself a dummy wallet. 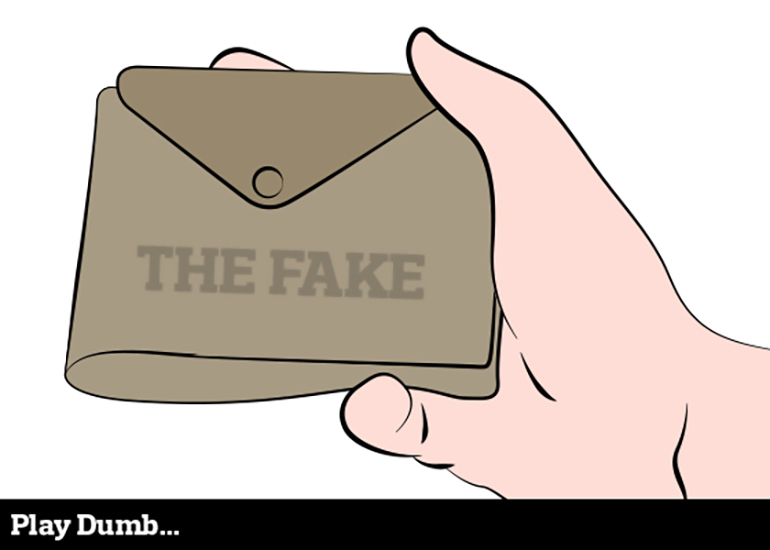 Remember: Don’t put any cards into your fake wallet that share private information about your identity. 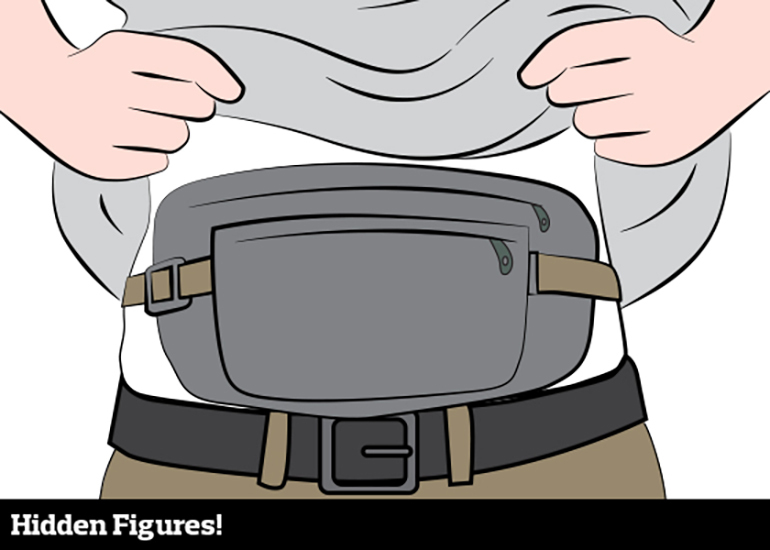 ‘Fanny pack’, ‘external money belt’, ‘bum bag’ – tom-ay-to, tom-ah-to. This old school cash carrying invention is coming back in fashion. Probably. This pouch is similar to a money belt, except it’s often larger and placed outside of your clothes and around your waist. If you’re the type of person who likes to see their wallet, this could work for you. Glance down and it’s there – and it’s relatively obvious should a potential thief reach for your waist. Bum bags will be most useful in areas where risk of pick pocking and mugging isn’t extremely high. And if you’re going for this option, buy a pack that can’t be easily unclipped. Remember: These packs often scream tourist, so assess whether it’ll be the best option depending on the area you will be visiting. 6. If you’ve got it, don't flaunt it! This is a must-do. Not optional. Mandatory. Please promise you’ll follow this, always. 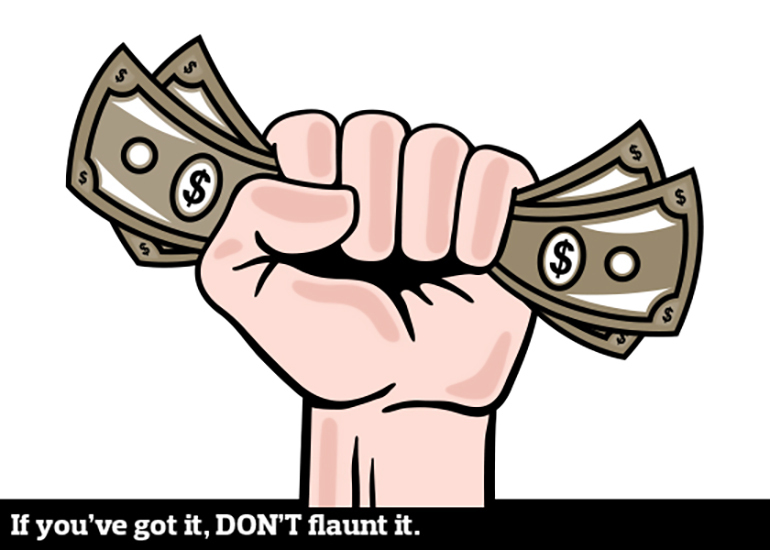 Never have your big bills in plain sight. If you’re buying something and a sales person sees you have a lot of money, they might up the price. Or people around could see your cash and you could become a target to be stolen from. And if you give a small tip while the person can see your big bills, it’s really awkward. Remember: Separate the big notes from the small notes – even consider having them in a hidden money bag. That way you won’t pull out a $100 bill for a $2 can of Coke. These are just 6 ways you can carry your currency abroad – but there are a million more. Whichever way you decide on, just make sure it secures your money. For more tips on keeping your travel money safe, chat to our friendly FXperts at your local store today. Megan has over 6 years experience in the travel and foreign exchange industry. With a passion for travel, Megan is continually looking for more "off the beaten track" destinations to explore.